This is my first visit to Ethiopia and even though I’ve only been here for four days it has already changed my life. Today we visited Ajuuja, a privately funded orphanage in Awassa. We brought with us bags of diapers, bottles, shoes, bedding, and clothes to leave for the children. The staff was so grateful for our contribution, although after seeing the orphanage it was clear to me that they could still use more. There was quite a contrast between this orphanage and the one we visited in Addis, where majority of the funding comes from the government. 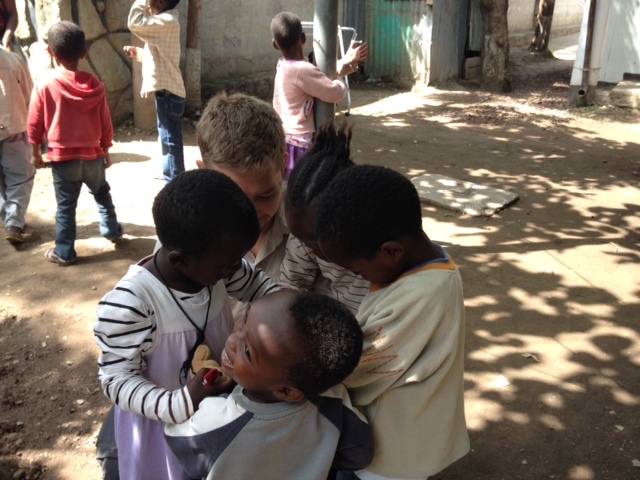 Ajuuja orphanage had fewer children and more staffing, which is certainly advantageous for the children. The difference was very apparent, although it still wasn’t up to standards that we may be used to in the United States. The staff does the best they can with the resources they have and the children are taken care of as well as possible. The staff has lots of love for the children and discussed how no child will ever be turned away, even if they don’t have the all the resources they need for the children they currently have. In fact, when we arrived we were told that they currently have forty eight children only to find out that two more were found last night, making it fifty. We were told that the children are usually found swaddled in rags and abandoned around the village and given to the police, then the police will bring them to the orphanage. One child that they were given last night was only three days old. We were welcomed with open arms by the staff; they even honored us with a coffee ceremony and a popcorn snack. The coffee was roasted out back, ground, and then made for us. It was some of the best coffee I’ve ever had. They also explained to us how a privately funded orphanage is different than one funded by the government. The majority of the funding for this orphanage comes from Project Hopeful. They have twenty teachers and three nurses on staff, which is a wonderful teacher to child ratio. It allows the staff to rotate in shifts so they don’t get burnt out, and enables them to give more individual attention to the children. It was obvious that unlike the first orphanage we visited these children were not lacking as much attention; although, of course, they loved the extra attention we were giving them. I noticed how well behaved the children were, full of patience, kindness, and respect for one another was well as all of the adults. All of the children were eager to show off for us, including one impressive five year old counting to ten in English and reciting her ABC’s! It also amazed me that children just a little older than one year old were being potty trained. A result of the expense of diapers I’m sure, but nonetheless shows the discipline and patience instilled in these children starting at a young age. Despite the circumstances the children are full of joy. They are constantly smiling, laughing and are grateful for even the littlest things. They are happy to shake your hands, be held and played with, or to kick around a freshly pumped soccer ball. They light up with happiness and their joy is infectious. It is so humbling to be here and see how thankful and full of happiness everyone is, even with so little. We have been welcomed with open arms and so many thanks everywhere we have gone. It is a great reminder to be grateful for all that we have, especially the little things that we might otherwise take for granted. It feels so good to know that even though it may be a small impact, we are making a difference in the lives of these amazing children. I’m so thrilled to have had this opportunity and can’t wait to see what the rest of the visit has in store.